1 of 3 Let lamb sit at room temperature for 45 minutes before placing in oven. Heat oven to 400 degrees . 2 of 3 Combine 3 tbsp of the oil, the garlic, mint, rosemary, lemon zest, 1 tsp of the salt and 1/2 tsp of the pepper in a bowl. Place lamb on a cutting board, butterflied side up. Rub mixture on entire inside surface of the lamb. Roll lamb tightly and tie several times crosswise and once lengthwise with butcher string to secure. 3 of 3 Place lamb on a rimmed baking sheet fitted with a wire rack. 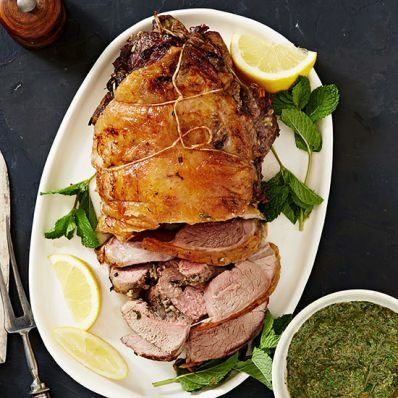 Rub lamb with remaining 1 tbsp oil and season with remaining 1 tsp salt and 1/4 tsp pepper. Roast at 400 degrees for 1 hour, 30 minutes to 1 hour, 45 minutes or until temperature reaches 145 degrees on an instant-read thermometer. Let rest 15 minutes, then slice crosswise. Serve with Mint Pesto, if desired.